The U.S. Food and Drug Association has approved new label changes for mifepristone—the drug used with misoprostol to induce abortions—that will make access to medication abortions harder to limit. 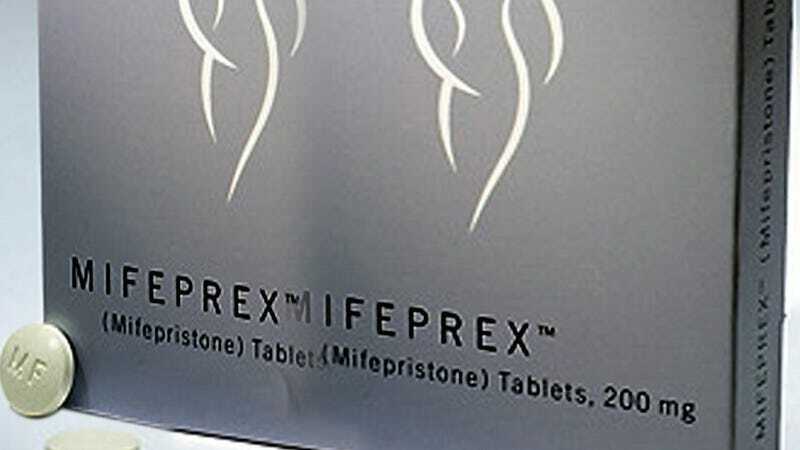 Anti-choice lawmakers have previously used the flimsy labeling of mifepristone (a.k.a Mifeprex) to severely limit women’s access to safe abortions. Laws dictating when the woman can take medicine, where she can take it, how she takes it, and the timing of the treatment have all had harmful repercussions on those seeking safe and legal abortion care, but new labeling by the FDA, backed by extensive scientific research, will make the instructions and procedure less easily manipulated. The new guidelines, as The Guardian reports, also recommend a lower dosage of mifepristone, 200 mg down from 600mg, and the higher dose of misoprostol. That’s the dosage that doctors who provide abortions have argued for years is safer and just as effective. Arizona, Arkansas, Ohio, Oklahoma, and Texas all have state laws requiring doctors to comply with the old, out-of-date dosage requirements. We are delighted that the FDA has approved a label change, which brings the label for mifepristone in-line with scientific research and evidence-based practice. Since mifepristone was initially approved by the FDA in 2000, National Abortion Federation members have used an evidence-based regimen, differing from the former label, allowing for a lower 200mg dose of mifepristone; and an alternate dose, route of administration, and place of administration for misoprostol. In 2013, our evidence-based Clinical Policy Guidelines, which set the standards for quality abortion care, also increased the gestational age this care could be provided from 63 days to 70 days. Because providers in the United States have already been providing evidence-based care, which the new label now recognizes, actual practice will not change. What will change is that politicians can no longer deny women access to this safe and effective method of early abortion care by insisting on an out-dated regimen. We hope the new label changes will soon allow women to access medical abortion care in states where anti-choice restrictions have made this evidence-based care unavailable. Access to reproductive services, including abortion care, is essential for women’s health. Medication abortion, performed through a combination of mifepristone and misoprostol, has provided a safe, effective option for induced abortion that has benefitted millions of women. In fact, 15 years of use of mifepristone for induced abortion has not just proven it to be safe and effective, but have also supported an evidence-based regimen that improves care and the personal experience for women who find that it is the right choice for them. ACOG is pleased that the updated FDA-approved regimen for mifepristone reflects the current available scientific evidence and best practices, and includes many of the recommendations that ACOG had presented to the agency. Extending approved use of mifepristone through 70 days of gestation is proven to be safe and effective, and will give them more time to make the decision that is right for them. We do believe that there is more work to do in updating the mifepristone label to reflect the current evidence. For example, ACOG believes that a Risk Evaluation and Mitigation Strategy (REMS) is no longer necessary for mifepristone, given its history of safe use. The REMS requirement is inconsistent with requirements for other drugs with similar or greater risks, especially in light of the significant benefit that mifepristone provides to patients. For example, while the agency notes rare cases of fatal infections, it is important to note that no specific connection exists between medication abortion and these infections, which can also occur with other obstetric and gynecologic processes and procedures. The mortality rate associated with medication abortion continues to be lower than the mortality rate associated with childbirth. Medication abortions have been deemed by health experts as safe and effective. They’re often considerably cheaper than surgical abortion procedures and potentially less time consuming (a factor that particularly benefits working women, women with children, and women who live in states with limited abortion providers). UPDATE: Here is the statement from Planned Parenthood. “First and foremost, this is another affirmation from the FDA that medication abortion is a safe and effective option to end an early pregnancy. Studies show medication abortion has a 99 percent safety record, and that medication abortion is up to 98 percent effective in ending an early pregnancy,” said Raegan McDonald-Mosley, Chief Medical Officer of Planned Parenthood Federation of America.